Rita Jahanforuz stage name Rita, is an Iranian-born Israeli pop singer and actress, notable for being the most famous female singer in Israel. After becoming a professional singer and performer in the 1980s, she has appeared in numerous concerts, many being "packed" with fans, including members of government. In 2011, she also became popular in Iran as an underground "singing sensation" after the release of various pop records which she sings in her native Persian language. Iran has tried to block Western-style pop music and filters the Internet. In 2012, her album " My Joys, " also sung in Persian, was popular in both Israel and Iran, going "gold" in Israel after three weeks. She has since been referred to as a "cultural ambassador" between Israeli and Iranian citizens, and states she hopes to "puncture the wall of tension" between their countries. However the album is less a political statement and more a return to her own roots. Rita began her career in 1980 as part of a musical troupe in the Israeli Army. In 1982, she attended the "Beit Zvi" school of acting. Her first exposure to the general public in Israel was at the 1986 Pre Eurovision Song Contest (AKA the Kdam-Eurovision), which decided who would represent Israel in the upcoming Eurovision Song Contest. Rita did not win, but her song,"Shvil habricha", along with her provocative performance, garnered much interest. That same year, Rita starred in an adaptation of My Fair Lady and released her self-titled debut album, Rita, which went triple platinum, selling over 120,000 copies. In 1987, she released the English language album Breaking Those Walls under the name of Rita Farouz. That album contained a couple English versions of her Hebrew songs from the first album as well as original material. Despite going gold in Israel, that album was not an international success. In 1988, Rita released her second album, Yemei Ha'Tom (Days of Innocence), which was produced by her husband, Rami Kleinstein, and which included a song by noted Israeli playwright Hanoch Levin. In 1988 and 1989 she was chosen as Singer of the Year by Israel's national radio station. In 1994 with her third album, Ahava Gedola (Big Love) which was also successful and led to a three-year tour around the country. Tahanot Bazman (Stations in Time) was released in 1996, consisting mainly of previously unreleased material. In 2006, Rita put on a new show called “One” which ran for a month at the Israel Trade Fairs & Convention Center. Directed by Hanoch Rozen, it was a lavish affair including lasers, flamethrowers, 3-D images, smoke machines and forty dancers, acrobats, and actors. Over 100,000 tickets were sold. After five years during which she didn't release any new albums, Rita released her 7th album, "Remazim" (Clues). In 2010 she performed in a special concert at the Presidential Residence in Jerusalem, in the presence of Italian Prime Minister Silvio Berlusconi, and Israeli president Shimon Peres. She sang her musical version to Bialik's poem Hachanasini tachat Knafeh and an aria in Italian. She released her new Persian single, "Shane", on June 22, 2011. Deciding to create a song in her childhood language of Persian, which she speaks fluently, she introduced the single, "Shaneh." The song is based on traditional Persian folk music, but modernized with a more pop and techno dance beat. Iranians of all ages have responded "overwhelmingly," Most Westernized popular music, including hers, is banned in Iran, which filters the Internet, however fans have nonetheless been downloading or buying bootleg copies of her latest albums. 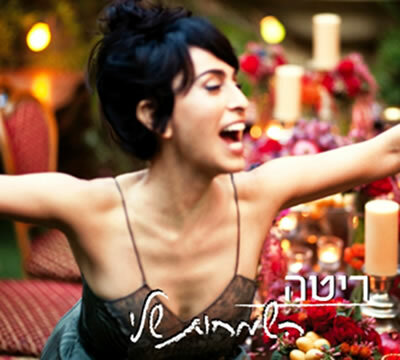 While Iranians living in other countries have "flooded" her recording studio with messages of admiration, especially after the release of her 2012 album, " My Joys ". She has been considered Israel's most famous female singer, effectively becoming a "cultural ambassador" between Israel and Iranian citizens. However, despite her popularity in Iran, their government declares her music merely a "plot" to win over the "hearts and minds" of Iranians, and part of Israel's "soft war" against Iran. Others in Iran have expressed "particular displeasure" at her for sending celebration messages to Iranians for Nowruz, the Iranian New Year. Visit artists website at www.rita.co.il/en/home/a/main/ or www.rita.co.il/he/home/a/main/.